Despite ordering three additional scripts (i.e. not episodes) at the beginning of the month, it looks the Wisdom of the Crowd TV show on CBS will be cancelled. The network has declined to order any additional episodes, leaving the final season one episode count at 13. A high tech crime drama, Wisdom of the Crowd stars Jeremy Piven, Richard T. Jones, Natalia Tena, Monica Potter, Blake Lee, Abigail F. Cowen, and Jake Matthews. 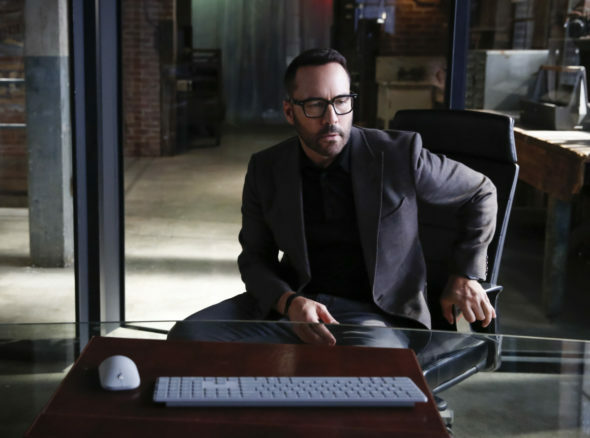 The CBS TV series centers on Silicon Valley entrepreneur Jeffrey Tanner (Piven) who designs an online platform for real-time, crowdsourced crime solving, in hopes of finding his child’s killer. The crime drama is slated to wrap production on its 13-episode original order in mid-December. Nine of them already have aired. For now, the plan is for the remaining four to continue to air in the series’ Sunday slot. The back order decision on Wisdom of the Crowd, delayed almost to the last possible moment, had been being complicated by an investigation CBS recently launched into sexual harassment allegations against star Jeremy Piven. To keep the writers room open, the network had ordered three additional scripts. While Piven has vehemently denied any allegations, more and more women have come forward, most recently a former Entourage extra who claimed over the Thanksgiving break that the actor sexually assaulted her in 2009. The first season of Wisdom of the Crowd is averaging a 0.97 rating in the 18-49 demographic and 7.45 million viewers. When sorted by its demo numbers, Wisdom of the Crowd ranks 17th of the 21 scripted CBS TV shows we’re currently tracking. When sorted by total viewership it rises to 11th place. Even without the off-screen concerns, it is possible CBS would have passed on additional episodes. What do you think? Have you been watching the Wisdom of the Crowd TV series? Should CBS cancel or renew it for season two? Sound off, in the comments. Wisdom of the Crowd: Is the CBS TV Series Cancelled or Renewed for Season Two? I agree, you are cancelling a lot of good shows and keeping the yawners on. Bring back. “Wisdom of the Crowd”… ” Zoo”… & “Chance.” Three good ones. PLEASE DO NOT CANCEL THEM. I agree completely … Finally a great series and slam the door on us once again. The show should be renewed! It is innovating and ripped from the headlines. Please renew season 2! I’m not a fan of the show, but to cancel a show based on allegations is uncalled for. Wait until an allegation proves true before condemning someone, otherwise we are back to witch hunts and burnings at the stake. Yes, I’ve been watching the show and enjoying it – as far as the “allegations” – that’s all they are at this point. If every show, movie, LIFE, was cancelled beause of allegations there would be no TV, movies or LIFE! I’d like to see who the killer is & then it can be gone. Computer shows have the disadvantage of being so over the top on the gimmicks they can do that it seems like a dramatic storyline is diminished by those same tricks. Given the premise of the series and the difficulty they’ve had trying to make their concept clear enough to care about, it really doesn’t surprise me that the ratings have been lacking. Computer-based series have a long history of being short-lived because there’s no “there” there. Piven’s character deficiencies notwithstanding, it’s difficult for me to see where there’s enough story here to go more than the first season; if he ever finds out who killed his daughter, the show loses its main reason for being. I watched the 1st 2 episodes, I wasn’t impressed so I stopped watching, I love Madame Secretary, I hope they don’t take that off. Glad it’s going! Boring… Yawn! I have watched every episode, but have gotten weary of the constant political bias they toss around. It is on the verge of being taken off our queue anyway, so I won’t shed any tears if it disappears. It is interesting about Piven though, as I had always thought he was a gay man. Show SHOULD return! At least until charges are substantiated ! I am not particularly enamored with the show. It can lead to more “crowd justice”. It’s better than some shows but I haven’t bothered to watch some of the episodes I recorded. Cancel the show is not an option, not when Mia’s killer still at large.